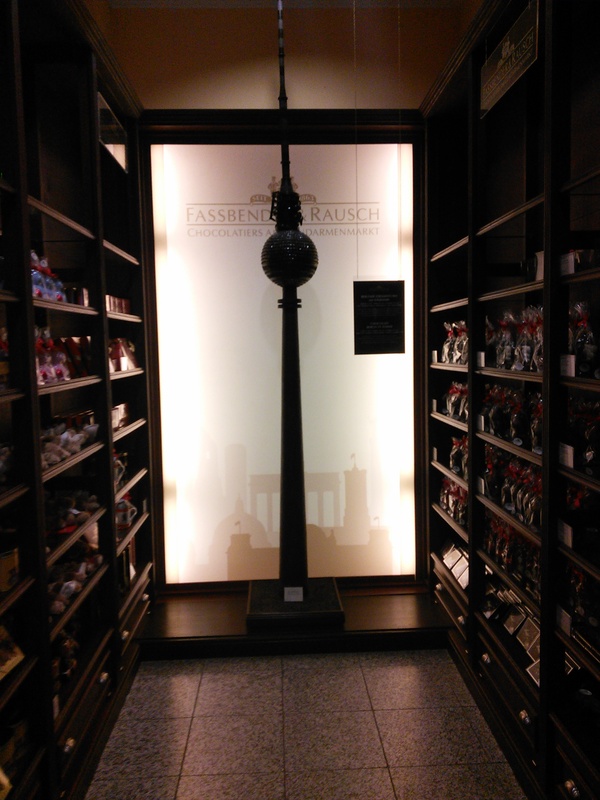 My latest trip was my first to Berlin. 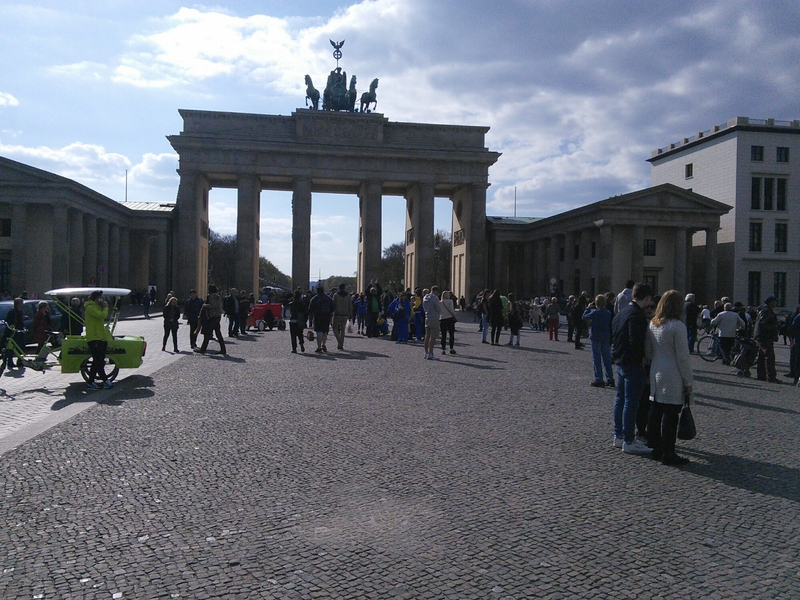 I have always found Berlin fascinating due to having grown up when the Cold War was in full swing, with Berlin and the Wall being the frontier between East and West. 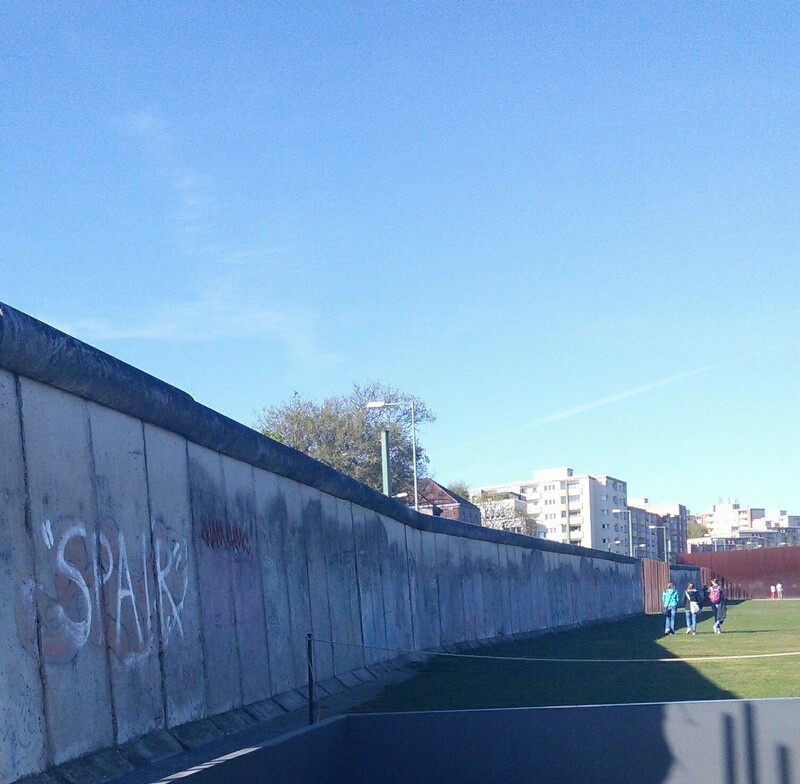 The wall particularly resonates as I remember it when it stood as an imposing symbol of the Cold War and when its fall heralding the end of it. 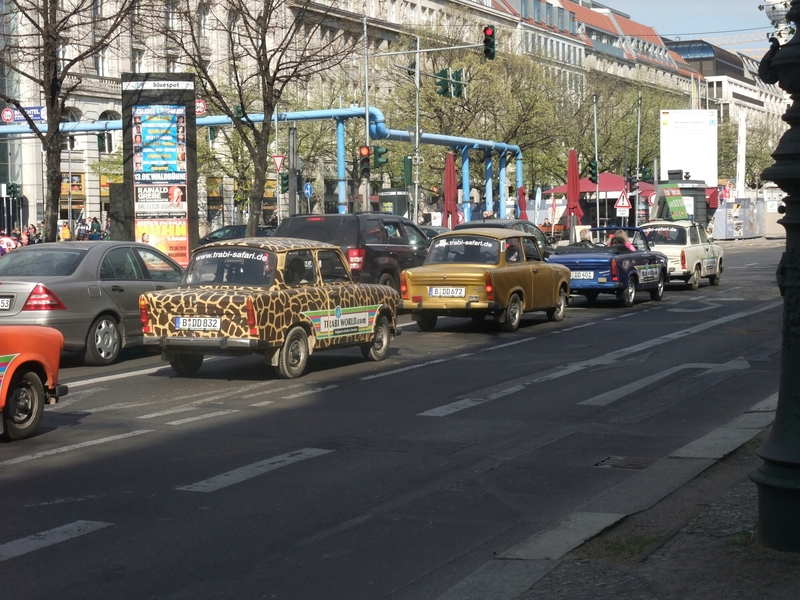 Berlin, to me, is a funny old place without what I would regard as a recognisable centre (no doubt due to the partitioning). If there is one I didn’t find it. I got lost more than once. It is suppose to be a very cool place, but that sort of thing is totally lost on a middle aged misery like me. 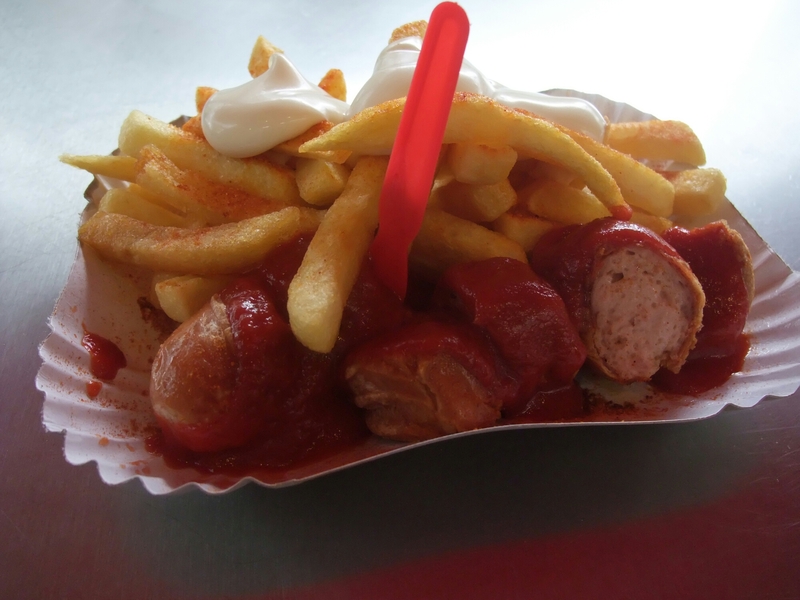 In terms of food, Germany has perhaps as much (if not more) of a bad rap as Britain and British food – with many assuming it is based on massive portions of heavy, uninspiring stodge. This stereotypical view is, in my view, as unfair as that attributed to British food. 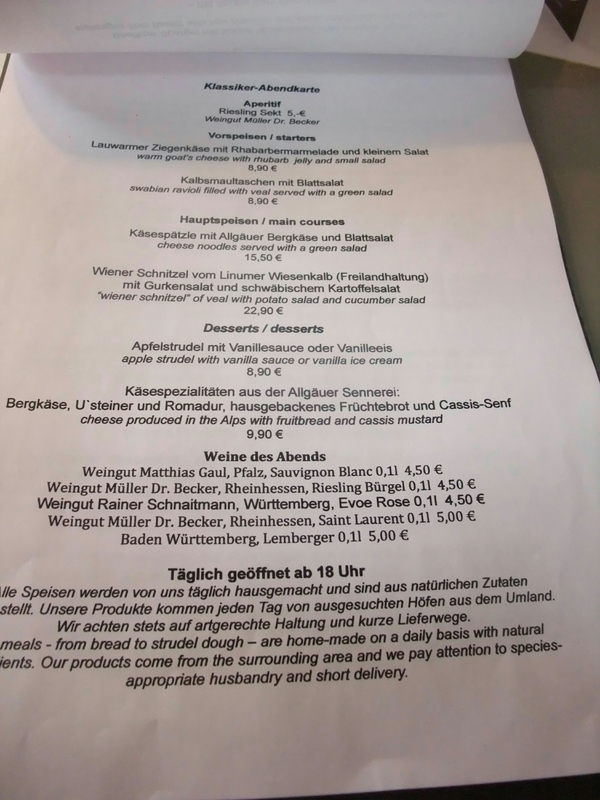 The portion size bit is a fair cop mind, as the Germans do seen to love big portions of everything and appear incapable of lasting any length of time without refuelling – massive meatfest breakfasts, followed by mid morning cake, lunch, mid afternoon cake and finally diner. It really is wall to wall food in Berlin. No wonder they work so hard – have to burn off all those calories somehow! 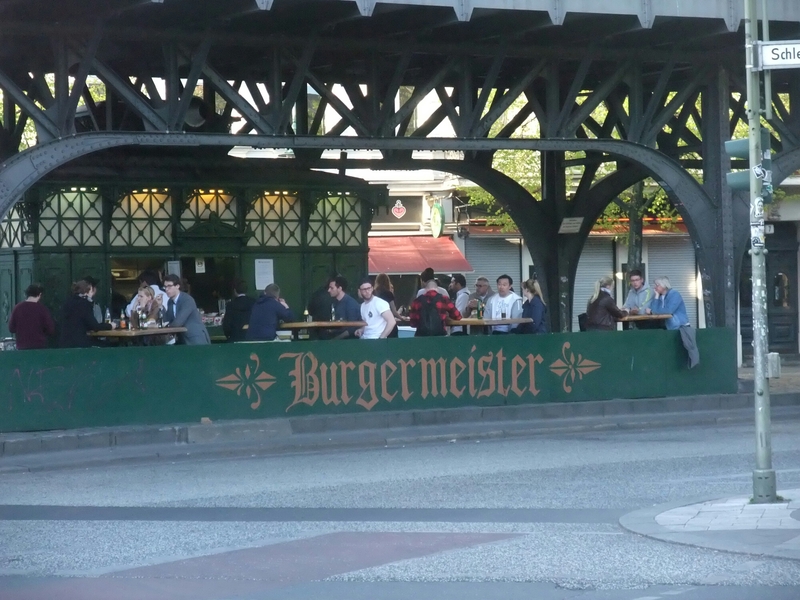 In terms of my trip, I had a number of nights where i could get out and about and below are some of the places I visited on the food front whilst I was in Berlin (I tried to stay pretty much traditional German – although a burger did sneak in, with my view being that a hamburger has a clear German connection). 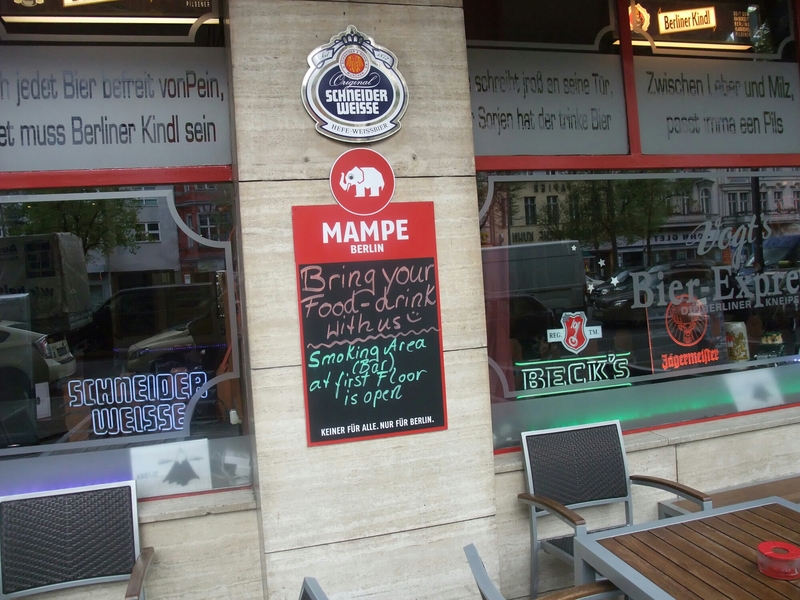 I was based in Mitte and this is reflected in my choices of places to eat. This charming little neighbourhood pub is great for just a beer or for food or even better both. 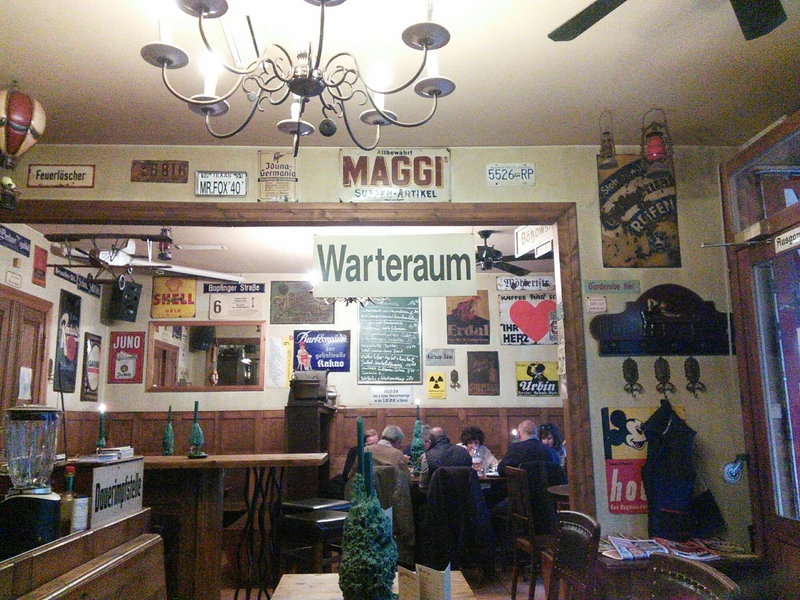 There is a short menu on a board on the wall, which I could not make head nor tail of (mainly because of a desperate need for new glasses rather than my shamefully rubbish German). 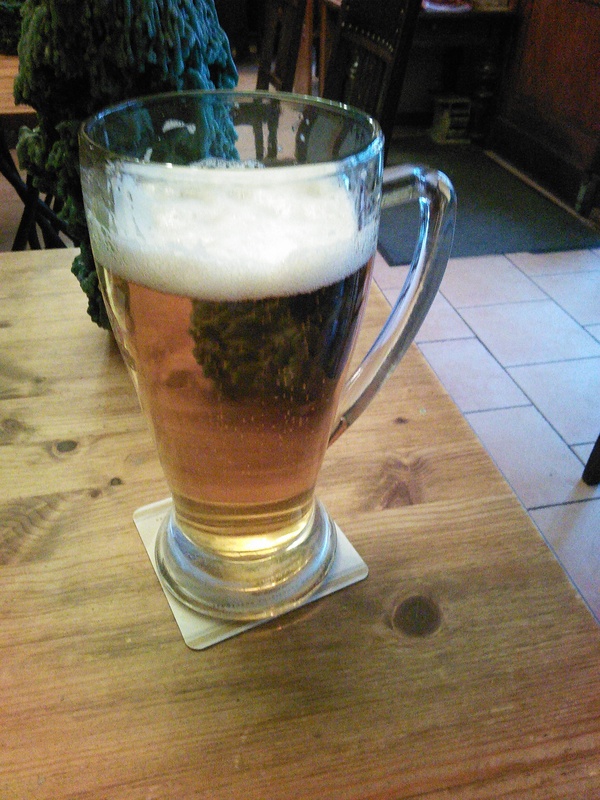 As a result the barman/quite possibly the owner (who said in perfect English he was sorry but he didnt really speak English – my response was it’s a million times better than my German ) got the chef to come out and explained it to me. It included staples of schnitchel (€16.70), sausages and sauerkraut (€10.90) and a German charcuterie board (€10 I think ) amongst other things. 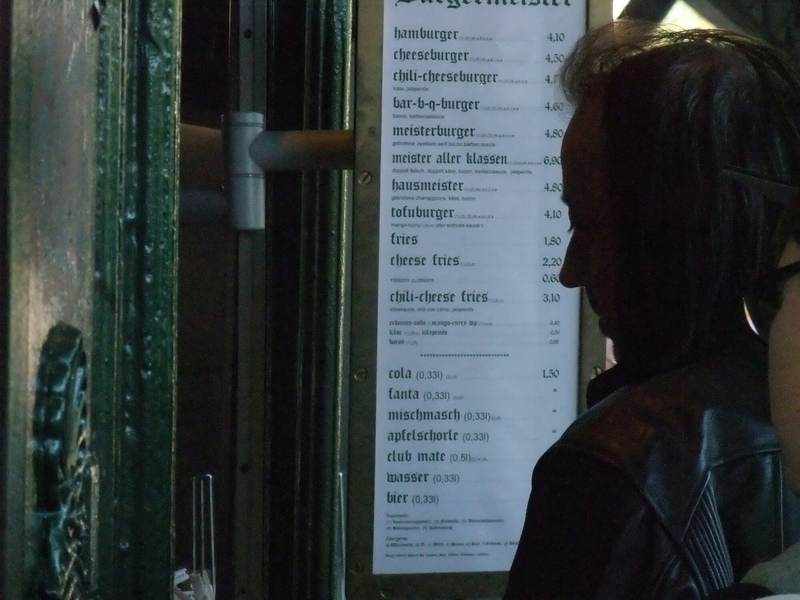 What I went for was a Berlin classic, in the form of calves liver in a rich gravy, with cooked sliced apple and mashed potato (€14.60- around the £10.70 mark). I love liver, especially calves liver – iron rich (felt very popeye like afterwards, as well as vituous) and full of goodness. The gravy it came in was downright delicious and everything was perfectly seasoned. Seeing me trying to scrap up every last drop of gravy, they gave me a spoon which stopped me causing embarrassment by using my finger (which I was about to do). Only odd thing was they put salad on the same plate. 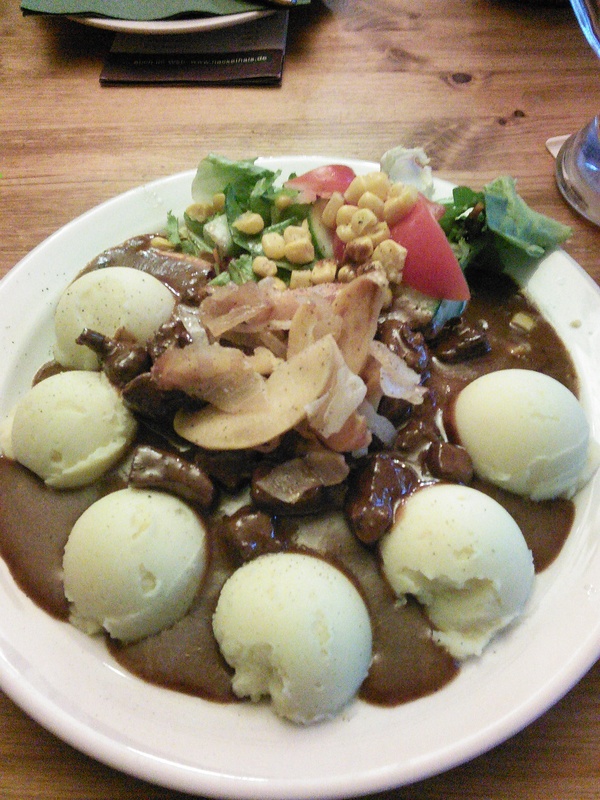 It was a nicely dressed salad, but a tad out of place on a plate of liver, gravy and mash (it was very good mash, with no lumps). Better on a side plate and in reality unnecessary. This dish wasn’t pretty or sophisticated, but what it was was downright tasty. Total cost with food and two beers (0.5l) €21.50 (excluding tip) (about £15.70). Tricky to find, but good directions can be found on their website. 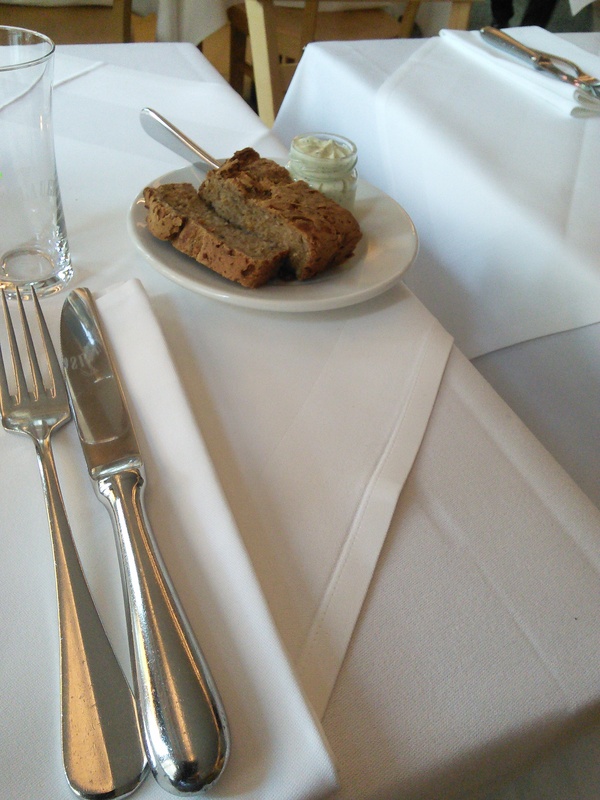 Classy joint this, with linen table cloths and very precise service. 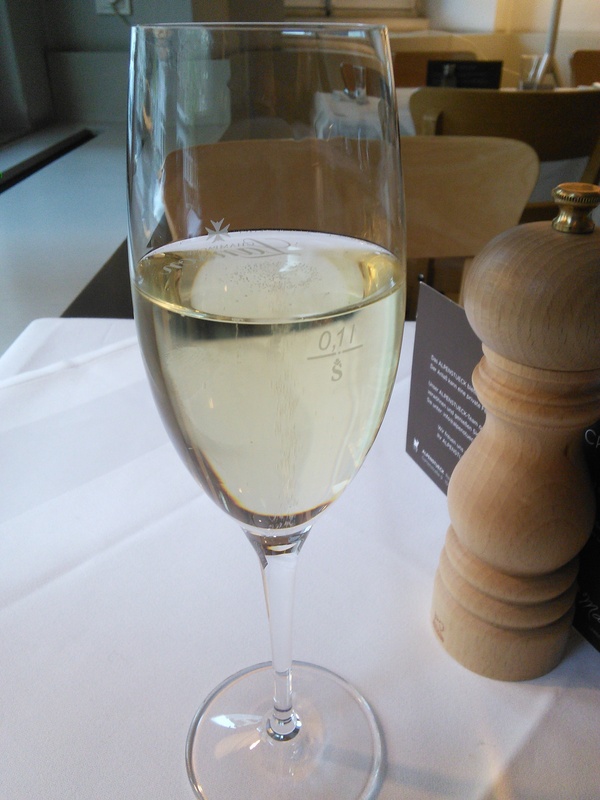 I started off with a riesling sekt fizz (€4.50). It had been a long day and whilst I am not usually a fizz fan I like a drop of fizzy riesling – dry without having too aggressive a fizz to it. Nice sharp apples on the nose and palate. The meal started with some great nutty bread (they have their own bakery across the road) with a little pot of garlic laced cream cheese . Very morish – I ate it all. This included various fixed price options. There was also a short al a carte menu. 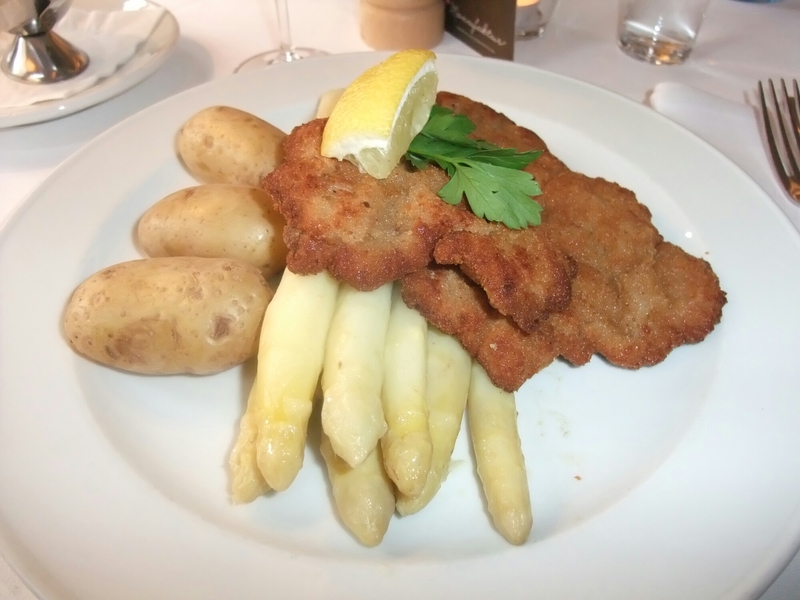 The schnitzel was wafer thin and beautifully crisp – coming with loads of white asparagus (Germans seem to prefer these to the green – white is nice but not a patch on English green asparagus in my view) and new potatoes. 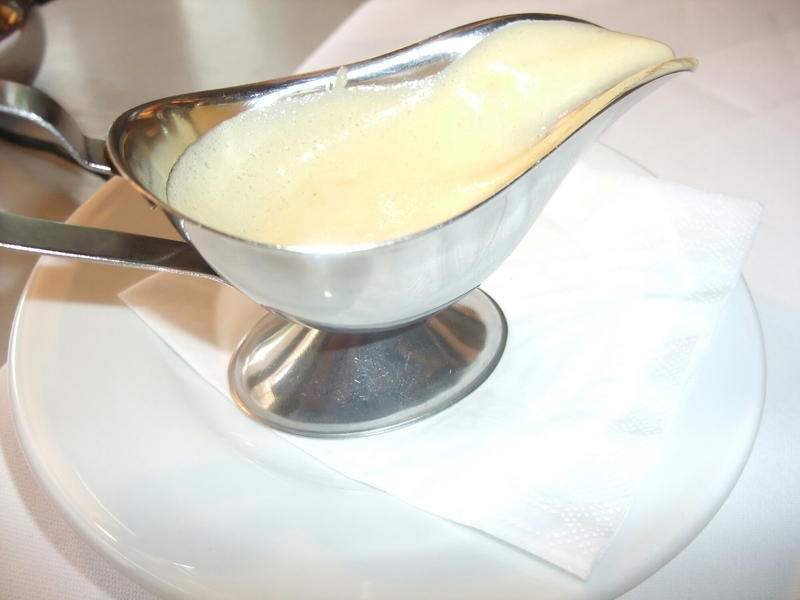 The accompanying hollandaise sauce was absolutely killer – light, but rich with just the right amount of acidity. I would happily have drowned attempting to consume a tanker of this stuff. A sound dish (with an outstanding hollandaise) if a touch pricey (although the good exchange rate at the time helped mitigate this). 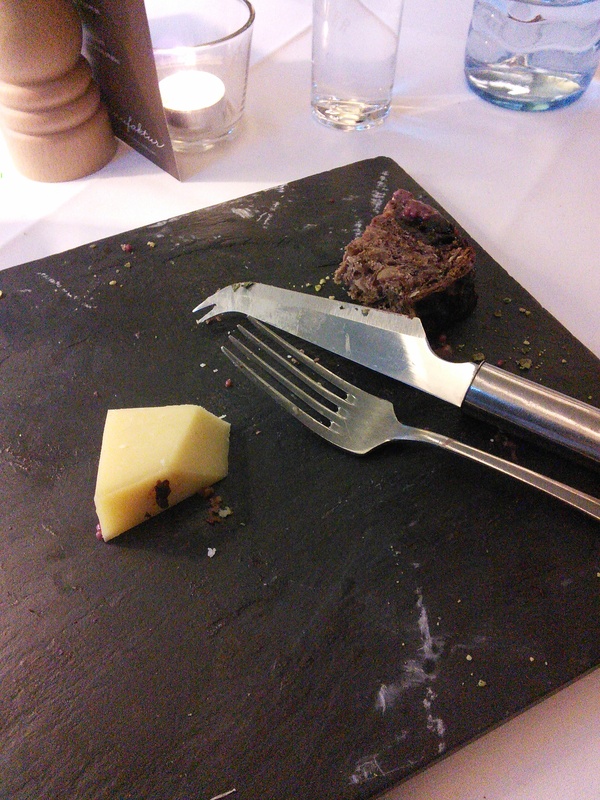 For pud, I was tempted by the Applestrudel but in the end decided on the Alpine cheese board (€8.90) which was a monster portion (on a slate – boo!!). 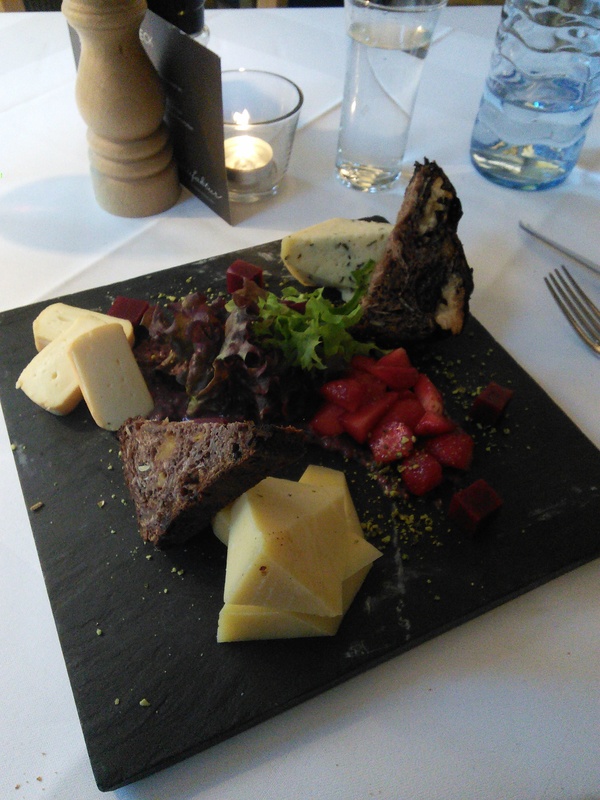 In addition to the massive chunks of cheese, there was a really good cassis and mustard based sort of chutney, fruit and nut rye bread, salad, strawberries and cassis cubes. Not sure what the three cheeses were – one was like chaume, another like a cheddar and the last one a bit like havarti. Whilst nice on their own, I thought the strawberries a strange addition. The cassis mustard chutney on the other hand was a revelation. Punchy and great with the cheeses. I waddled back to my hotel, safe in the knowledge that breakfast would not be needed in the morning. Total cost, with drinks (but not including tip), was €53/£38 (water was very pricey at €7 for 0.75l). 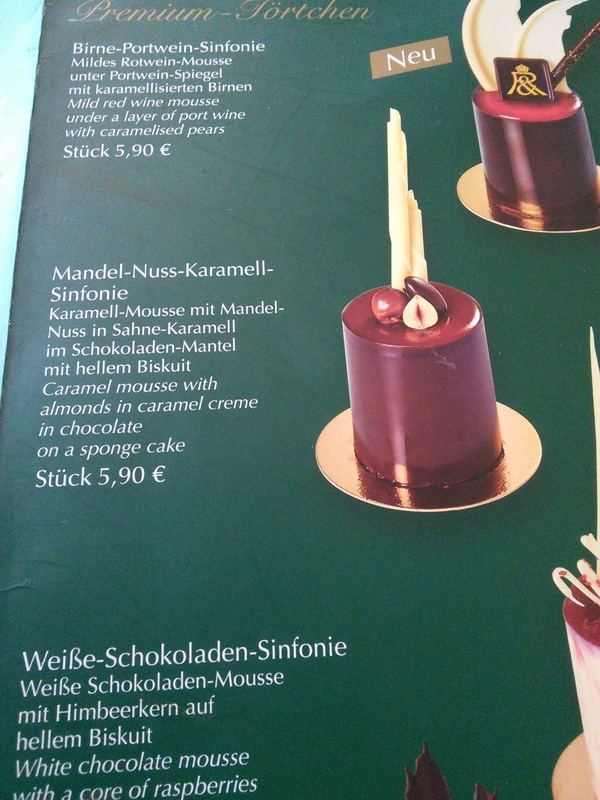 You can’t go to Germany and not have a cake and this place (in the top 10 for Berlin on TripAdvisor and close to various sights) fitted the bill nicely when I was feeling a bit low on the calorie count. 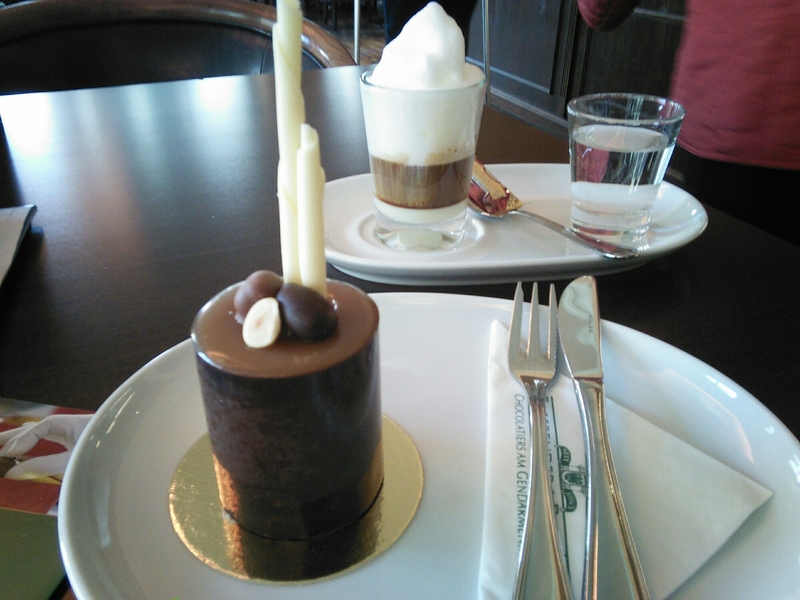 I went for a chocolate and caramel mousse concoction. This was a caramel mouse filled cylinder of thin as you can physically make it tempered chocolate. 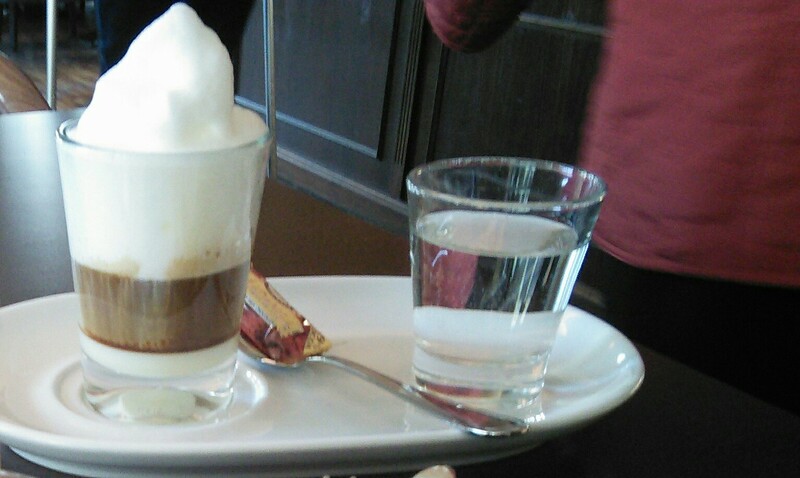 Coffee was a bit odd – my fault for ordering what I did, but I do find the German and Austrian predeliction for added whipped cream/jumbo foam toppings to every coffee somewhat perplexing. Nearest U-Bahn station: Mohrenstrasse or Stadtmitte ( both on U2). Ask someone about German food and most people would say sausage. Berlin’s contribution, in the form of the currywurst, at first blush does not look or sound at all promising. 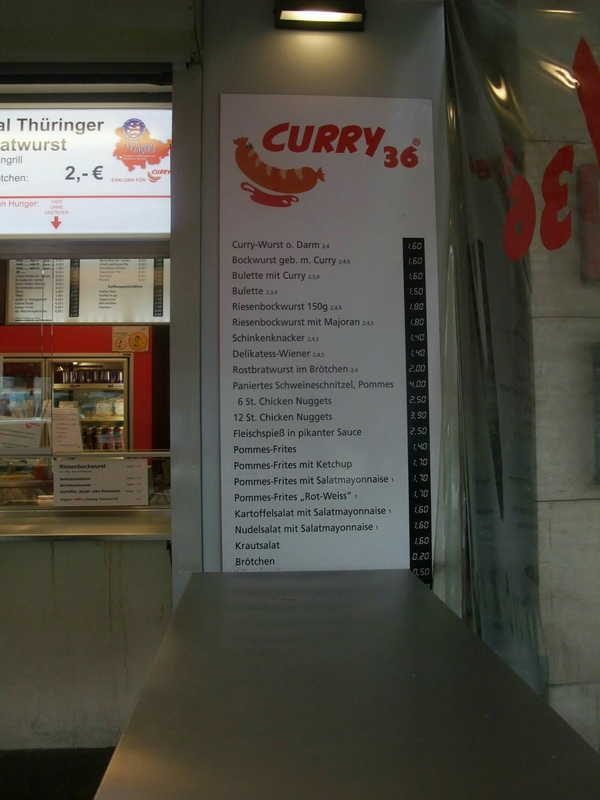 The Currywurst is a German sausage (100% meat – no filler allowed) on to which curry powder is sprinkled liberally. It is then smothered in homemade (not Heinz) ketchup. Whilst not a looker it is a surprisingly pleasing bit of fast food. Wurst stands/outlets abound in Berlin. 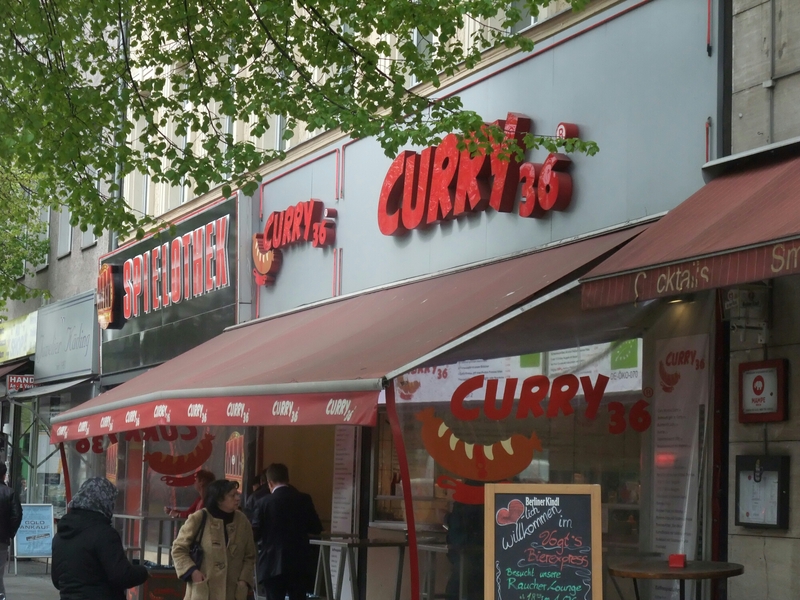 Lots of competition to be the best of the wurst (sorry, terrible pun) and Curry 36 is one of the better ones by all accounts. Not fancy in any way, but inexpensive (€3.30 for a currywurst and chips with mayo – I do like mayo with my chips), this is that bit of dirty food you crave once in a while. 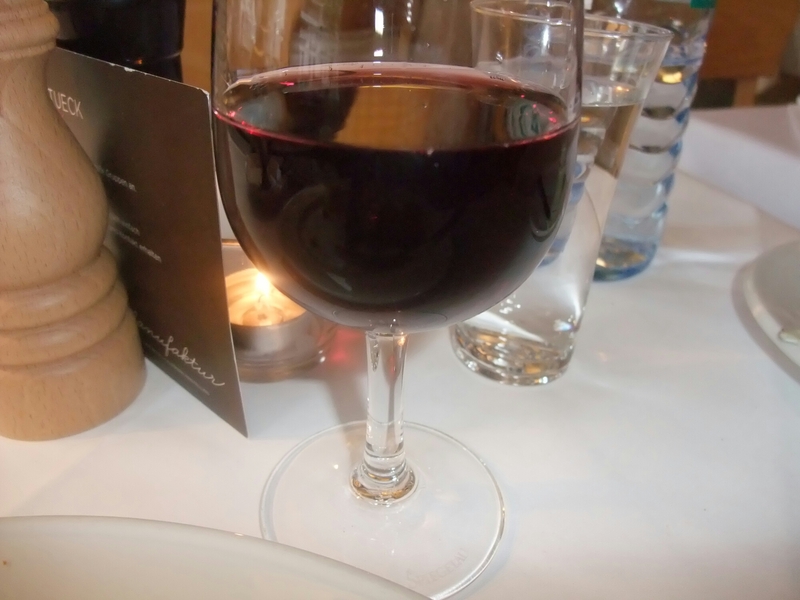 Great to soak up booze in the evening or as a quick lunch. Interestingly there is a bar next to this place that does “BYO” on food. So you can have beers there and when you get the munchies nip next door to Curry 36 for food which you can bring back to the bar. Now that is a idea I would like to see catch on here in the UK. Total cost with small bottle of water €4.30/£3.15 (water seems to be pricey in Berlin). This place is a burger stand in what use to be a public toilet. It is under a railway line and sits on an island between various busy roads. Doesn’t sounds promising does it!! It is, however, listed in a book I have titled “1000 Places to eat before you die” so I had to give it a go. It took me ages to find it, after trying to walk there and in doing so getting hopelessly lost, but boy was it worth it. Apparently the queue can be horrendous, but mid week on a sunny day at around 7pm I queued for a couple of minutes and waited a further 10 for my food (with a beer in hand and the sun out this was fine by me). What I got was a great tasting (clearly hand made patty) cheeseburger with a nice exterior crust and a lovely yielding juicy interior (encased in a nice toasted bun), with decent crispy “cheese” fries (with that gloopy cheese sauce that is one of those guilty pleasure you know you shouldn’t enjoy, but always do) and a bottle of beer (33cl). This very tasty and filling meal cost me €8.20, yes you read it right €8.20. In Sterling (at current exchange rates) that is about £6.20. So cheaper (all in with fries and beer) than just the small bacon cheese burger (small) (not very good either) at Five Guy in Cardiff (without fries or even a soft drink) and infinitely better. Bargain doesn’t even come close to describe the price of food of the quality they deliver at this place. 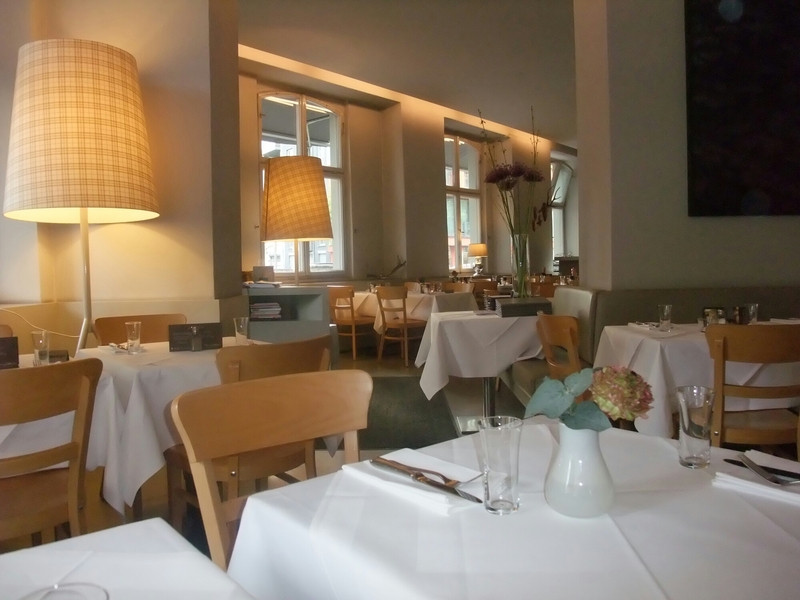 Berlin is quite the foodie place, ranging from the high end Michelin star joints (expenses on trip weren’t generous enough allow me to explore any of these) to cheap takeaway joints. 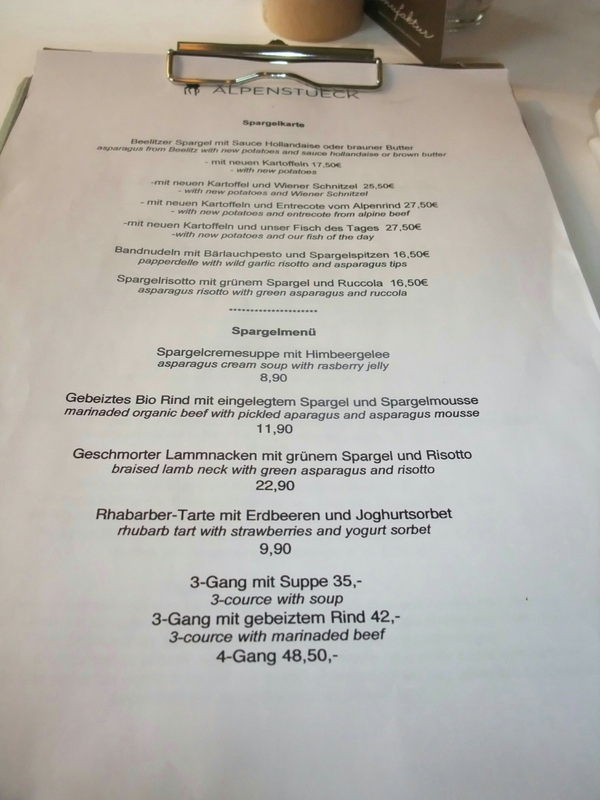 One thing is for sure, you will never go hungry in Berlin with food outlets everywhere and from my experience it is a place where you can eat out well quite cheaply. Would I go back? 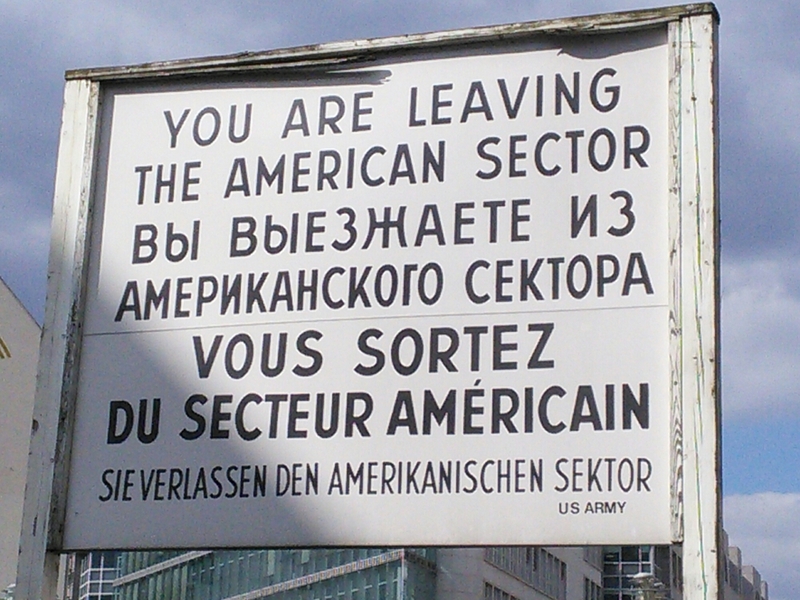 If I am ever in Berlin again I would certainly have no qualm about visiting any of these places again. On the value front, Burgermeister takes some beating. 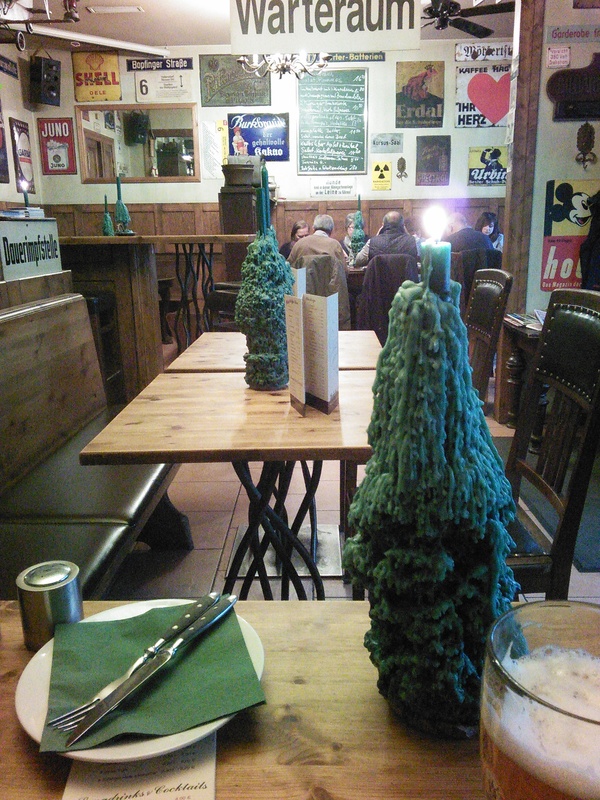 I also really liked the homely charm of Hackelthal. The other places were also good in there own ways but at very different ends of the spectrum from each other. 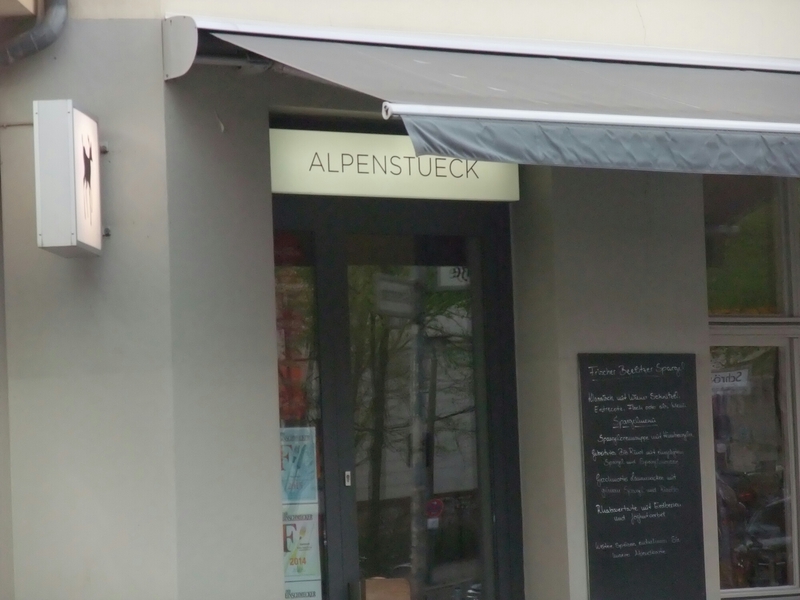 It was certainly handy to have someone else paying the bill at Alpenstueck. 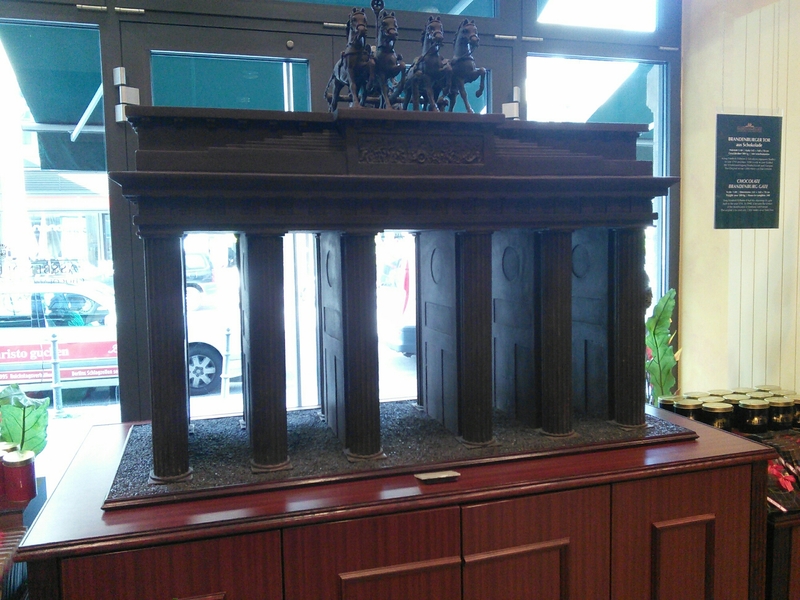 I travelled to Berlin with Flybe from Birmingham International Airport and stayed in the Mercure Hotel Berlin City in Mitte, which was nice enough and conveniently located for getting to and from the Airport and to the city sights. 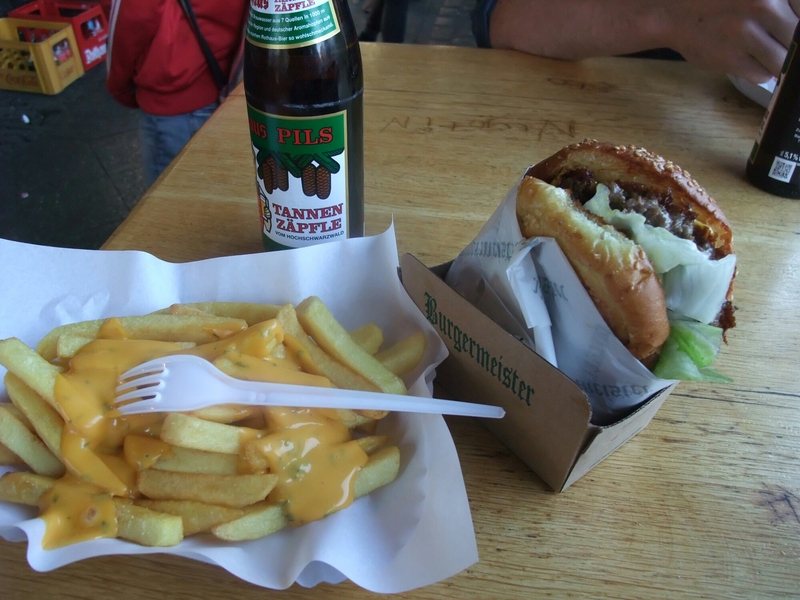 This entry was posted on May 10, 2015 by solicitingflavours in Berlin, Burger, Burgermeister Berlin, burgers, cake, cheese, Drink, Fast food, Fine dining, Food, Food and wine products, German food, Germany, outside UK, Pub, Red Wine, Restaurant Review, Riesling, sausages, Sekt, White wine, wine.